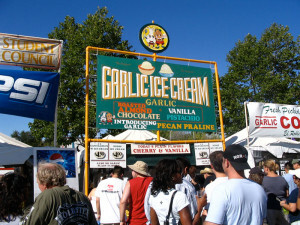 Garlic ice cream always draws a crowd at garlic festivals. Many different garlic festivals are held in the U.S. and Canada each year, with most occurring in August or September when fresh garlic is plentiful. Much like garlic, each festival has its own unique flavor. Some focus on growers and providing information about different types of gourmet garlic to grow while others are geared more towards garlic and cooking. Most festivals include entertainment, cook-offs, poster contests, and arts and crafts activities for kids. You’ll also often be able to find more than just garlic, with many growers bringing not just their best garlic but also other herbs, spices, and vegetables. The Gilroy Garlic Festival is one of the largest and best-known garlic festivals but you’ll find many different regional festivals listed below. If you’d like to see your festival added, please contact us with your basic information.